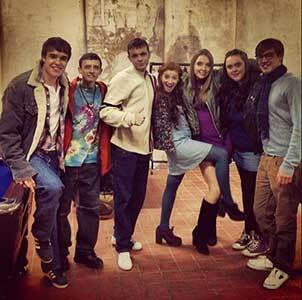 Sharon Rooney and Ciara Baxendale wear red and pink high top Converse “Chuck Taylor” All Stars in the series. Rae Earl seated on a bench. In a television show about mental illness, depression, and fantastical diary drawings, it is always comforting to see a quirky, frank character tackle the struggles of the world with her favorite chucks on her feet. The main character of the show is Rae Earl, recently released from a psychiatric ward for attempting to take her life, struggles to reintegrate herself into the complexities of teenage society. She is nothing special, your average music loving, boy loving teenager with weight and anxiety issues. She works to reconnect with her old friend Chloe, and her new group of friends, including some very cute boys that Rae eyes. She writes of all her problems, thoughts, and fantasies in her journal, and her voice narrates all the adventures she and her friends get into. Rae Earl and her friends. The show is quick and sharp, full of snarky, sarcastic wit and moments of deep compassion. Rae is insightful and, though introverted, cares much for her friends. Furthermore, her relationship with her therapist, Kevin, is poignant and meaningful. Despite her dysfunctional relationship with her mother, this too is a source of compassion and meaning in Rae’s life, that gives the whole show a deeper dimension. Of course, as in any witty, British teenage show, love, romance, and intimacy are driving forces in each episode. Rae falls for the dashing, mysterious Finn Nealson, and they’re relationship is sweet as it is humorous. Both of them, as well as the rest of the gang, are hip and young, balancing tragedy and joy, wreaking havoc and learning to love. Furthermore, each character adopts their own edgy, quirky style. Rae is always sporting dark clothing with flannel and rock band logos, and as always her trusted chucks. Sometimes Chloe and her friends try to get her to dress more feminine and flirty, but Rae always returns to her original style, just as she always sticks to her intuition and spirit. Promotional poster for the show. 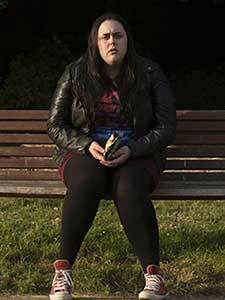 Throughout the series, Sharon Rooney, in her role as Rae Earl, wears red high top chucks. 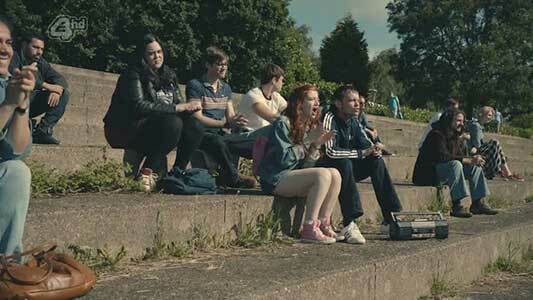 Another friend, Izzy, played by Ciara Baxendale, wears pink high top chucks.